Same business day computer support in Melbourne, and Nationally throughout Australia. We the leading computer support provider in Melbourne. If you need a reliable on-time computer support service, you have come to the right place. We have necessary skills and resources to provide fast and reliable services. We have highly trained and experienced technicians to provide computer support. We can provide the support remotely via our helpdesk or onsite computer support. Having ITswitch supporting your computers means that you have more time to concentrate on your business rather than fixing the computer related issues. Helpdesk computer support – A dedicated helpdesk to that you can call or email with your support request. Support is provided by taking remote control of your computer. All services are logged and recorded into our ticketing system. 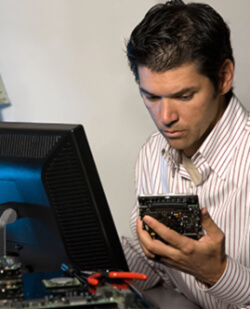 Onsite computer support – A technician will attend to your issues onsite and your premises. Technicians attend with all the necessary equipment and common parts so that problems can be fixed in on the spot. Remote support- This service is used when the problem is minor and can be fixed easily by using remote computer support tools. In this, we will access your computer using the available tools and fix the problem from our office. Obviously it is very time and money saving technique.